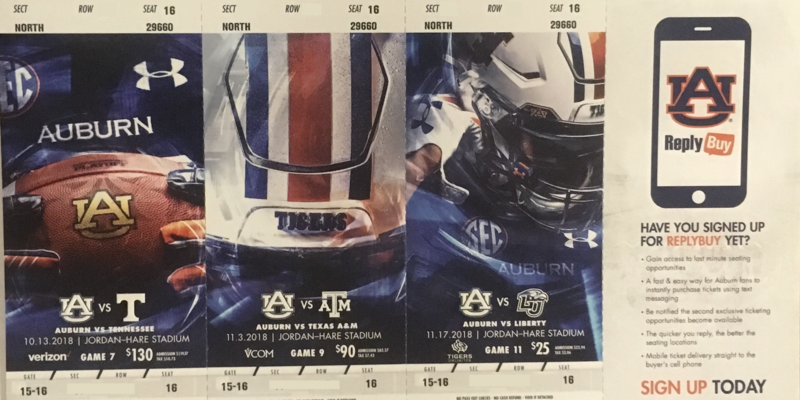 Season ticket packages for the upcoming 2018 Auburn football season have shipped… and some have been received like a deep pass thrown from Jarrett Stidham’s manly hands. There aren’t any subtle shots (that I’ve seen) in the images like previous years. They are just good solid tickets focused on Auburn’s uniform, the best uniform in sports. I tell you, though, it’s good to see that ticket prices are going dow… $130 FOR TENNESSEE?! They haven’t won a game in a decade have they? I guess when the new, terrible rotation of SEC East opponents keeps you from playing teams every millennium, people are going to be excited when some teams come to town.